What happened to 36-year-old Marilyn Lucille Palmer? On February 28, 2018, Marilyn Lucille Palmer, mother of a 13-year-old son, was “found” hanging in her jail cell shower, in the Grand Traverse County jail, in Traverse City, Michigan. According to the Sheriff’s Office, “She was unresponsive and not breathing.” Since then, the Sheriff has maintained that the jail could use some help and funds, but basically everything is ok. Everything is decidedly not ok, not in the Traverse County Jail nor in jails across the United States. What happened to Marilyn Lucille Palmer? She was dumped in a local, and nationwide, hole of systemic unresponsiveness … to women, to people of color, to those living with mental health needs, to those living with any health needs, to people. 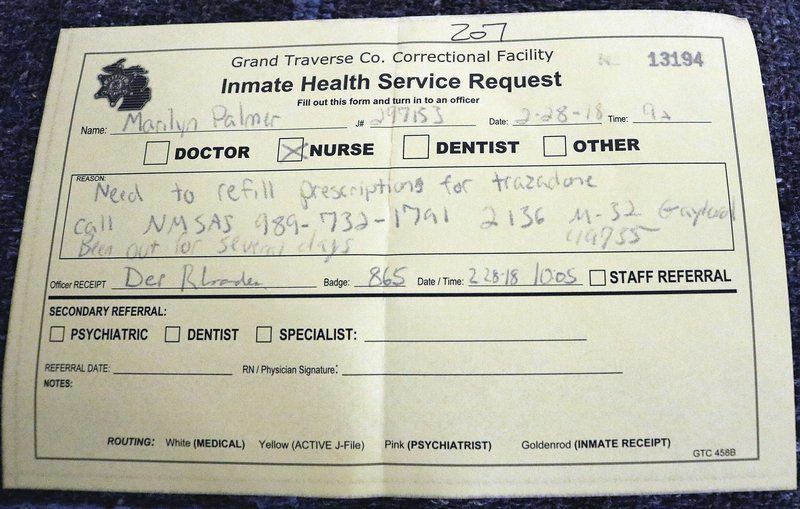 In 2014, the National Institute of Corrections issued a report on the Traverse County jail. They found the jail ill equipped for “special populations”. They found the cells worsened the health of those living with mental illness. They estimated that around 80% of inmates were living with mental illness; they found that suicide attempts had become a common occurrence. What’s the word for an institution that exhibits deliberate indifference and in which suicide attempts have become the new normal? Jail. What happened to Marilyn Lucille Palmer, in 2018? She went to jail. She needed and asked for help; none came. She killed herself. She was found unresponsive. She went to jail. What happened to 35-year-old Jessica DiCesare last year? 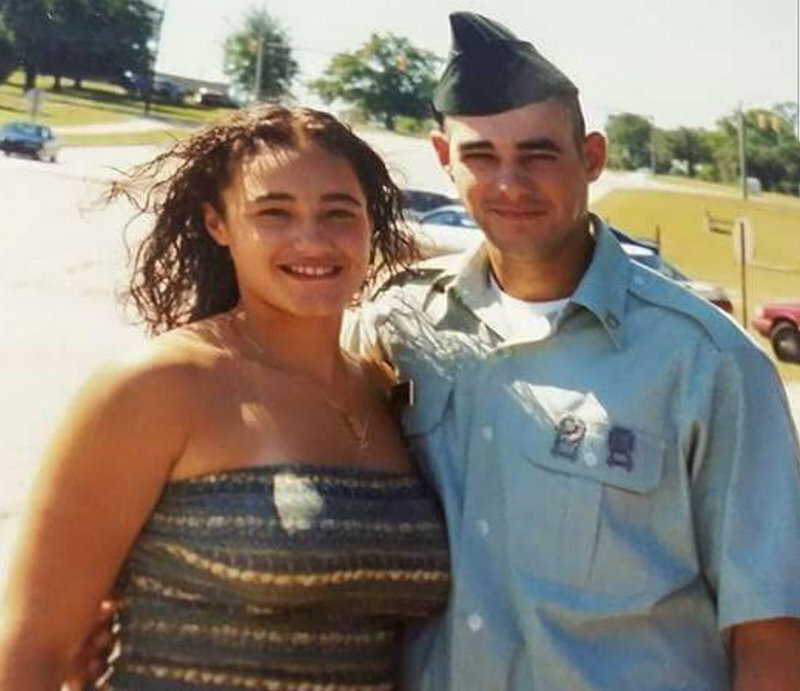 On July 8, 2017, Jessica DiCesare, mother of two, was “found” dead in her cell in the Barnstable County Correctional Facility, in Buzzards Bay, Massachusetts. The investigation officer found a note, which read, in part, “This place is so fucked … this is not justice, nor innocent until proven guilty, nor `good for the common wealth’. We are treated like sub-animals here …. I’m losing my mind / I want to die.” On July 7, following a panic attack, Jessica DiCesare wrote a note to the jail staff, which read, in part, “Being in segregation is deteriorating my mental status, as well as my physical health. I have no prior convictions, no prior jail time, and was placed here almost one month ago. I have PTSD … Being locked in here is bringing my mental health status back 10 years … also having been taken off my meds I have been on. I went from running a successful business to mental deterioration because of being locked up 23 hours a day … I also suffer major depression, bipolar disorder, prior hospitalizations for suicidal feelings and am losing my mind in here.” Am losing my mind in here. Despite the pleas from a social worker who had read the note, the supervisor of mental health clinicians decided that DiCesare did not require any special attention. What happened to Jessica DiCesare? The routine torture of women in jails in Massachusetts and across the United States. On July 11, 2017, Jessica DiCesare was pronounced dead. From schools to streets to courts to jails and prison, everyone who comes into contact with the aptly named criminal justice system is meant to struggle with this guilt. It’s an additional fee levied on “those who chose”, chose to be poor or of color or immigrant or woman or LGBTIQ or living with mental illness or living with drug addiction. Those who “made poor choices” carry an impossible debt they never incurred. You know who doesn’t feel huge guilt. The medical supervisor at Barnstable County Correctional Facility, who insisted that Jessica DiCesare did not warrant special attention. And so now, jail officials intone their version of “prayers and thoughts”, namely that jail is not designed to be a mental health institution nor an addiction treatment facility . “Every suicide is a tragedy.” How long before the individual tragedies are seen, collectively, as an epidemic? At what point do we recognize that jail is the public health crisis? When do Sue and Richard DiCesare stop being made to feel guilty? In 2017, fourteen people died of suicide in Massachusetts’ prisons and jails, the highest number since the last peak, in 2014. Of the 14, 4 were in Massachusetts prisons and 10 were in Massachusetts jails, where prisoners include people awaiting trial and people sentenced to up to 2 ½ years. Massachusetts houses about 20,000 people in jails and prisons, with about 10,000 in each. Three weeks prior to Jessica DiCesare’s death, 21-year-old William Jarosiewicz “was found dead” in his cell at the same Barnstable County Correctional Facility. Jessica DiCesare joins the circle of Tanna Jo Fillmore, Madison Jensen, Madaline Christine Pitkin, Sarah Lee Circle Bear, Christina Tahhahwah, Amy Lynn Cowling, Ashley Ellis, Kellsie Green, Joyce Curnell, Sandra Bland, Kindra Chapman, Kellsie Green and so many other women who have “been found” in America’s jails. Jessica DiCesare begged for help; her family pleaded for help. When did asking for help become a death sentence? According to a report released today, 2015 recorded “the highest number of executions … in more than 25 years (since 1989).” Along with the `highest number of executions”, many jails, prisons and immigrant detention centers are experiencing the highest number and the highest rates of suicide. Once more into the global work of necropower: “In our contemporary world, weapons are deployed in the interest of maximum destruction of persons and the creation of death-worlds, new and unique forms of social existence in which vast populations are subjected to conditions of life conferring upon them the status of living dead … Under conditions of necropower, the lines between resistance and suicide, sacrifice and redemption, martyrdom and freedom are blurred.” Welcome to the necropolis. In the United Kingdom, the number of suicide attempts in “immigration removal” centers is at an all-time high. In 2015, there were 393 attempted suicides recorded. Harmondsworth topped the list at 105. Yarl’s Wood came in second at 64. In 2014, there were 353 attempted suicides. Harmondsworth led again with 68, and, again, Yarl’s Wood came in second with 61. 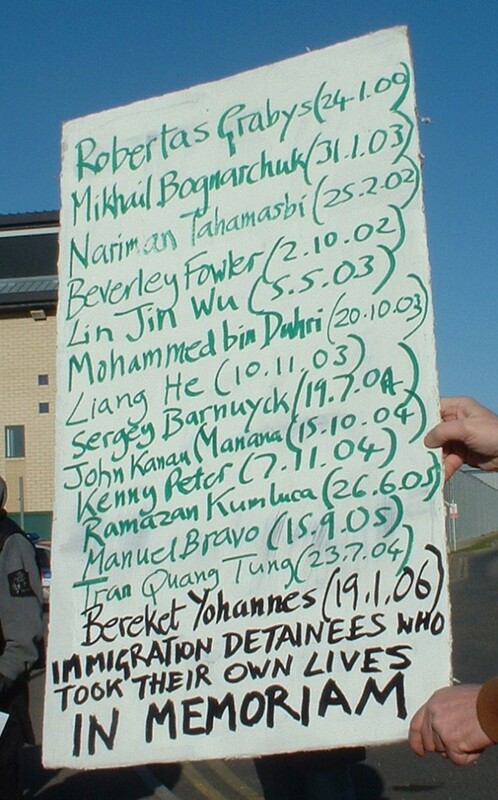 In 2015, 2,957 detainees were on suicide watch during 2015. Of that number, 11 are children. Meanwhile, in 2014, prison suicides in England and Wales reached a seven-year high. The Probation Ombudsman for England and Wales found a 64% increase in self-inflicted deaths in custody over the previous year. There is no surprise in either the seven-year high in prisons in England and Wales, nor in the all-time high in immigrant detention centers. In the United States, during the Obama administration, there have been 56 deaths in ICE custody. These include six suicides and at least one death after an attempted suicide. Eloy Detention Center, in Eloy, Arizona, holds pride of place in this race to the bottom. As of July 2015, 9 percent of detention deaths nationwide since 2003 occurred at Eloy, where 14 of the 152 total deaths occurred. In 2013, women prisoners in Eloy went on hunger strike to protest the conditions. As Thesla Zenaida, an Eloy hunger striker, explained: “Look, a girl hanged herself. A girl was hanged here. [After] she was hanged, they didn’t want to take her body down. And for the same reason—because they treat us poorly. A guard treated her poorly, and that guard is still working here.” And now, three years later, people still ask, “Why so many suicides? Meanwhile, in 2015, the Arizona prison system recorded close to 500 attempts at self-harm and suicide, another record broken. In Illinois, in the Kane County jail, the suicide rate is three times the national average, and no one on staff seems to care. In August 2013, Terry Ann Hart hung herself in the Kane County jail. Now, almost three years later, her daughter is taking the county and the sheriff to court. In a little over a year, Kane County had three suicides and one attempt, while nearby larger jails had no suicides from 2011 to 2015. Terry Ann Hart’s daughter wants to know how it’s possible for so many people to kill themselves and for no one to be held accountable and for nothing whatsoever to change inside the jail. From executions to prison suicides, these numbers are the census of the death-world, where now what is blurred is the line between the living dead and the dead dead. Record-breaking numbers of suicides occur, and nobody knows? How much higher must the piles of women’s corpses rise before the `discoveries’ end and the work of justice begins? Look, a girl hanged herself. A girl was hanged here. ¡Ni una mas! Not one more!